Fibrosis of the liver is an inherent wound healing response to chronic liver injury. Regeneration of liver epithelium and restoration of normal liver structure were generally involved in this process. Although the liver has a striking capacity to adapt to damage through tissue repair, excessive accumulation of extracellular matrix during this process often leads to scar tissue formation and subsequent fibrosis. Epithelial to mesenchymal transition (EMT) enables a polarized epithelial cell to undergo multiple changes biochemically and to bear a mesenchymal cell phenotype. EMT plays a critical role in tissue and organ development and embryogenesis. In the liver, it is proposed that epithelial cells can acquire fibroblastic phonotype via EMT and contribute to fibrogenesis. This made EMT a potential target for antifibrotic strategies. Following an original passion, many investigators devote themselves to exploring this mechanism in liver fibrosis. However, as research continues, this hypothesis became highly controversial. The exact contribution of EMT to fibrogenesis was challenged due to the contradictory results from related studies. In this review, we summarized the recent advances regarding EMT in hepatic fibrosis and discussed the potentially involved liver cell types and pathways in order to reach rational and helpful conclusions. Background/Aim: The association between sarcopenia and nonalcoholic fatty liver disease (NAFLD) has been suggested by recent epidemiological studies, although the results have been inconsistent. 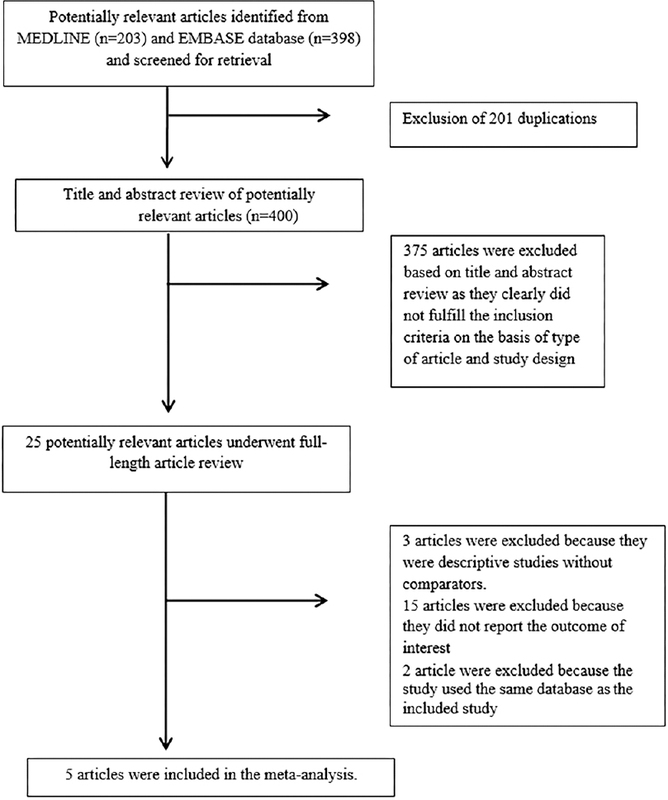 This meta-analysis was conducted to summarize all available data and estimate the risk of NAFLD among patients with sarcopenia. Materials and Methods: A comprehensive literature review was conducted using MEDLINE and EMBASE databases through November 2016 to identify all studies that compared the risk of NAFLD among patients with sarcopenia versus those without sarcopenia. Effect estimates from each study were extracted and combined using the random-effect, generic inverse variance method of DerSimonian and Laird. Results: Five cross-sectional studies with 27,804 participants met the eligibility criteria and were included in the meta-analysis. The risk of NAFLD in patients with sarcopenia was significantly higher than those without sarcopenia with the pooled odds ratio of 1.54 (95% confidence interval, 1.05-2.26). The statistical heterogeneity was high with an I2of 83%. Conclusions: A significantly increased risk of NAFLD among patients with sarcopenia was observed in this study. Background and Aim: Peroral endoscopic myotomy (POEM) is a technically demanding procedure. Recently, a new triangular knife with integrated water jet function (TTJ) has been introduced. The present study was aimed to analyze and compare the operating time, efficacy, and adverse events (AEs) between the conventional (TT knife) and new knife (TTJ). 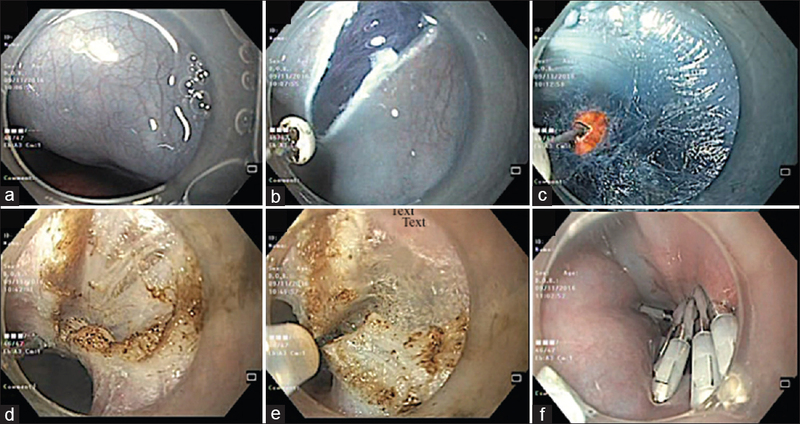 Patients and Methods: All patients with achalasia cardia (AC) who underwent POEM between August 2015 and November 2016 were analyzed retrospectively. 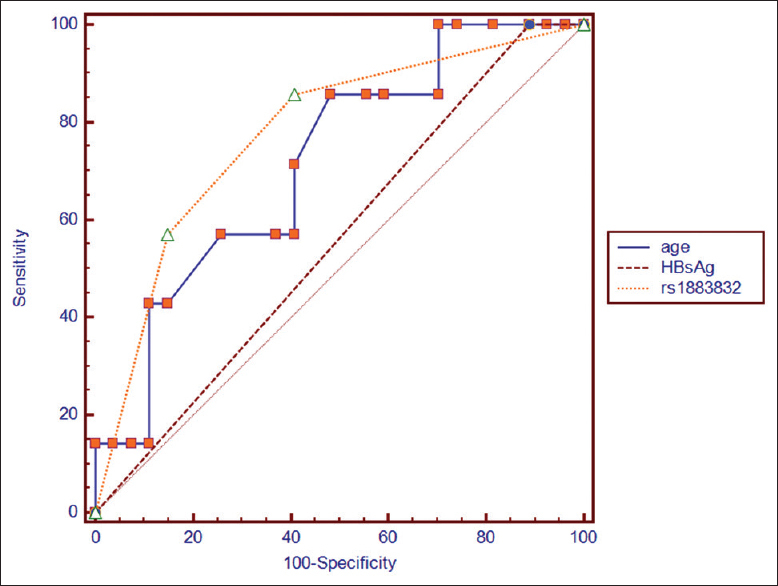 Operating time (OT), technical success, and AEs were assessed and compared between TT and TTJ knife. Results: A total of 193 patients with AC underwent POEM during the specified period. Both groups had equivalent number of different subtypes of AC (I, II, and III). There was no difference in technical success between the two groups (TT, 99% vs TT, 98.9%). OT was significantly less in the TTJ group as compared to TT group (53.8 ± 15.2 vs 66.26 ± 19.2; P = 0.0001). On subanalysis, OT taken for submucosal tunneling was significantly less with TTJ knife (34.6 ± 10.1 vs 45.83 ± 14.80), whereas OT was similar for myotomy and clipping in both the groups. Significantly fewer use of coagulation forceps and exchanges of accessories were required in TTJ knife group (2.92 ± 1.77 vs 10.5 ± 3.58; P = 0.0001). There were no major AEs. Minor AEs were noted in 21.5% and 31% of patients in TTJ and TT knife groups, respectively. Conclusion: New triangular knife reduces procedure time and technical difficulty with POEM. POEM is an efficacious treatment for achalasia and can be safely executed in an endoscopy unit. Background/Aim: A reduction in portal vein inflow velocity seems to predispose to the emergence of portal vein thrombosis (PVT). Nonselective β-blockers (NSBBs), used to prevent variceal bleeding, may increase the development of PVT by reducing portal vein inflow velocity. 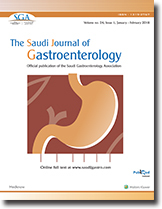 In this retrospective case-control study, we evaluated the risk factors and clinical features of a first event of PVT in 130 cirrhotics, 19 (15%) with (PVT group) and 111 (85%) without PVT (non-PVT group). Patients and Methods: Patient evaluation and NNBB treatment were carried out according to the AASLD guidelines. Results: PVT was prevalently partial (84%) and asymptomatic (84%). Patients with PVT were treated with different regimens, and resolution of thrombosis was observed in about 50% of the cases. In both groups, HCV was the most frequent cause of cirrhosis and Child-Pugh score A was prevalent. 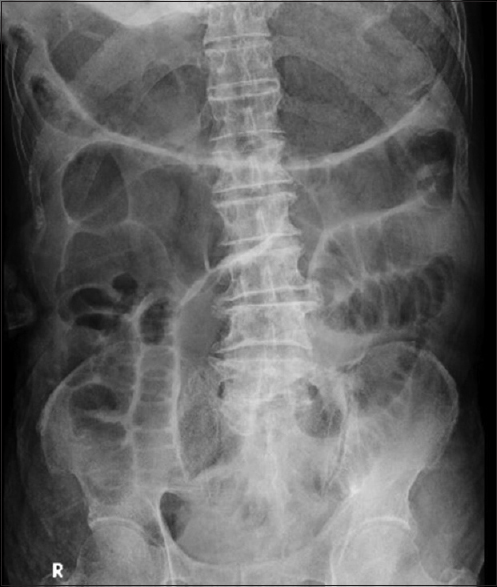 Ascites and esophageal varices were more frequent in the PVT group (P = 0.05 and <0.000, respectively). Treatment with NSBBs was significantly more frequent in the PVT group than in the non-PVT group (P < 0.000). PVT was associated with higher prevalence of chronic renal disease (P = 0.002), higher PT impairment (P = 0.003) and lower AST and ALT (P = 0.000). At multivariate logistic regression analysis, history of esophageal varices (P = 0.007) and NSBB treatment (P = 0.0003) were independent risk factors significantly associated with PVT. 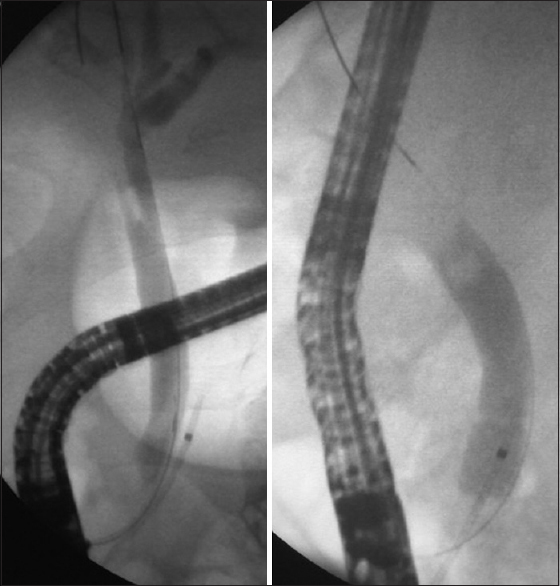 Conclusions: Esophageal varices and NSBB treatment were independent risk factors of PVT. Larger studies should evaluate the risk between variceal bleeding and portal vein thrombosis of using NSBBs, particularly in the prevention of first bleeding in nonadvanced liver cirrhosis. Background/Aims: The optimal duration of nucleos(t)ide analogs (NAs) therapy in chronic hepatitis B (CHB) patients remains unsatisfactory. Previous studies have confirmed the important role of host genetic factors in determining the outcome of HBV infection. This study tries to determine the role of host genetic factors in predicting response status in CHB patients discontinuing NAs according to stringent cessation criteria. Patients and Methods: Participating patients came from a prospective NAs- discontinuation cohort since June 1999. Six single-nucleotide polymorphisms (SNPs) were selected according to previous report. SNaPshot assay was used for DNA SNPs analyses. Results: Seventy-six CHB patients were enrolled in our study, of which 61 patients were HBeAg-positive and 15 patients were HBeAg-negative. rs1883832 in the Kozak sequence of CD40 displayed an AUROC of 0.778 in predicting response status in CHB patients with HBeAg seroconversion and a genotype of CT was associated with sustained response in this subpopulation. The diagnostic performance of combinative index (rs1883832, age, and HBsAg at discontinuation) seemed to be better than that of rs1883832, but no statistical difference was observed. rs1883832 was also evaluated as an independent factor for response status by multivariate logistic regression. For HBeAg-negative CHB patients, rs9277535 at HLA-DP presents a Spearman correlation coefficient of 0.582 (P = 0.023) with virological relapse after discontinuation of NAs. Conclusions: rs1883832 serves as a valuable predictive factor for CHB patients with HBeAg seroconversion. rs9277535 at HLA-DP might also be a valuable predictive factor for CHB patients with HBeAg-negative, however, further verifications are recommended due to study limitations. Background/Aim: Currently, it has been proposed that combination of 5-fluorouracil (5FU) with inhibitors of the mitogen-activated protein kinases (MAPKs) signaling pathway might enhance the efficacy of 5FU-based chemotherapy in colon cancer. Our study aimed to investigate an impact of TWIST1 silencing on the sensitivity of cancer cells to 5FU and selected MAPK inhibitors. 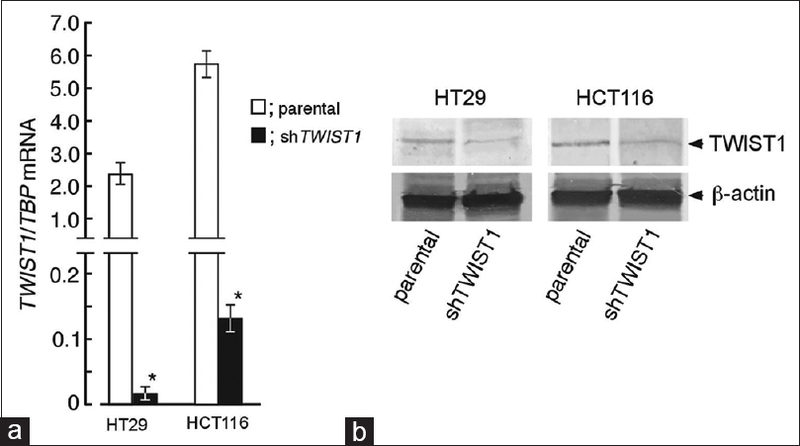 Materials and Methods: The suppression of TWIST1 expression in human colon cancer HT29 and HCT116 cell lines was achieved by transduction with lentiviral vector carrying the TWIST1 silencing sequence (pLL3.7-sh TWIST1). The statistical calculation was performed with analysis of variance or Dunnett's test for comparison to control group. Paired Student's t-test was performed when two groups were analyzed. Results: Suppression of TWIST1 reduced the proliferation rate of colon cancer cells and enhanced their sensitivity to 5FU and MAPKs inhibitors. The sensitivity of HT29 cells to examined compounds was more dependent on TWIST1 expression level compared to HCT116 cells. The most noticeable effect of TWIST1 suppression on sensitivity of both colon cancer cell lines to combined treatment of 5FU and the MAPKs inhibitors was observed for inhibitors of p38α/β and JNK1-3. We also noted that the suppression of TWIST1 significantly sensitized both cell lines to combined treatment of 5FU and Rac inhibitor. Conclusions: Our observations point to TWIST1 expression level as a marker of colon cancer sensitivity to combined treatment of 5FU and MAPKs inhibitors. Background/Aim: A pleural effusion is an abnormal collection of fluid in the pleural space and may cause related morbidity or mortality in cirrhotic patients. Currently, there are insufficient data to support the long-term prognosis for cirrhotic patients with pleural effusion. In this study, we investigated the short- and long-term effects of pleural effusion on mortality in cirrhotic patients and evaluated the benefit of liver transplantation in these patients. Patients and Methods: The National Health Insurance Database, derived from the Taiwan National Health Insurance Program, was used to identify 3,487 cirrhotic patients with pleural effusion requiring drainage between January 1, 2007 and December 31, 2010. The proportional hazards Cox regression model was used to control for possible confounding factors. Results: The 30-day, 90-day, 1-year, and 3-year mortalities were 20.1%, 40.2%, 59.1%, and 75.9%, respectively, in the cirrhotic patients with pleural effusion. After Cox proportional hazard regression analysis adjusted by patient gender, age, complications of cirrhosis and comorbid disorders, old age, esophageal variceal bleeding, hepatocellular carcinoma, hepatic encephalopathy, pneumonia, renal function impairment, and without liver transplantation conferred higher risks for 3-year mortality in the cirrhotic patients with pleura effusion. Liver transplantation is the most important factor to determine the 3-year mortalities (HR: 0.17, 95% CI 0.11- 0.26, P < 0.001). 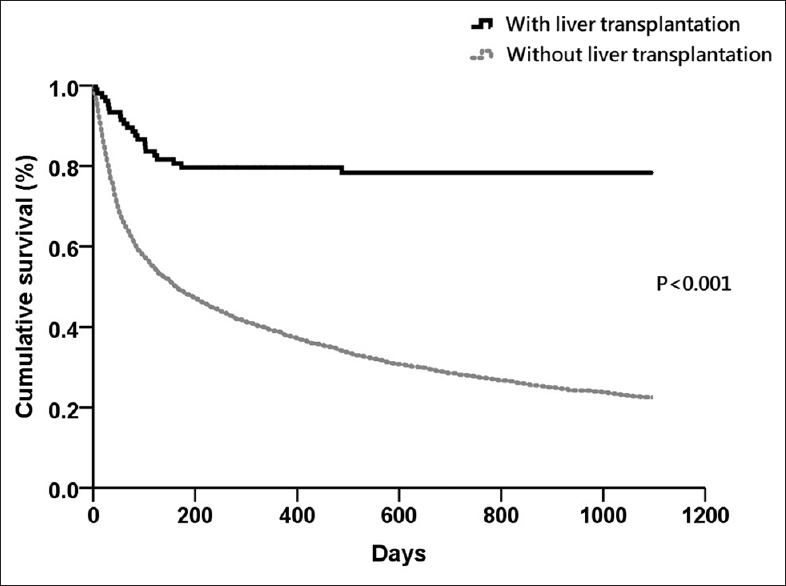 The 30-day, 30 to 90-day, 90-day to 1-year, and 1 to 3-year mortalities were 5.7%, 13.4%, 20.4%, and 21.7% respectively, in the liver transplantation group, and 20.5%, 41.0%, 61.2%, and 77.5%, respectively, in the non-liver transplantation group. Conclusion: In cirrhotic patients, the presence of pleural effusion predicts poor long-term outcomes. Liver transplantation could dramatically improve the survival and should be suggested as soon as possible. Background/Aim: To compare early stoma closure with conventional stoma closure following defunctioning diversion stoma surgery with respect to the frequency of complications, health-related quality of life (QoL), and length of hospitalization (LoH). Patients and Methods: This study was designed as a prospective parallel-arm randomized controlled trial. Patients who underwent temporary stoma following bowel surgery between February 2014 and November 2015 were included. The rate of complications (medical and surgical) following early and conventional stoma closure was assessed. Health-related QoL and LoH were also measured. Results: One hundred patients were included, with 50 cases in each group. Postoperative complications including laparostoma (6% vs. 2%;P = 0.307), wound infection (32% vs. 18%; P = 0.106), intra-abdominal collection (14% vs. 18%; P = 0.585), anastomotic leak (4%vs. 8%;P = 0.400), and medical complications were comparable (22% vs. 32%;P = 0.257). The length of hospital stay, overall mortality and morbidity (64% vs. 44%; P = 0.05) were similar across the two groups. There was a significant reduction in the cost towards stoma care (96% vs. 2%; P = 0.001) in the early stoma closure group. 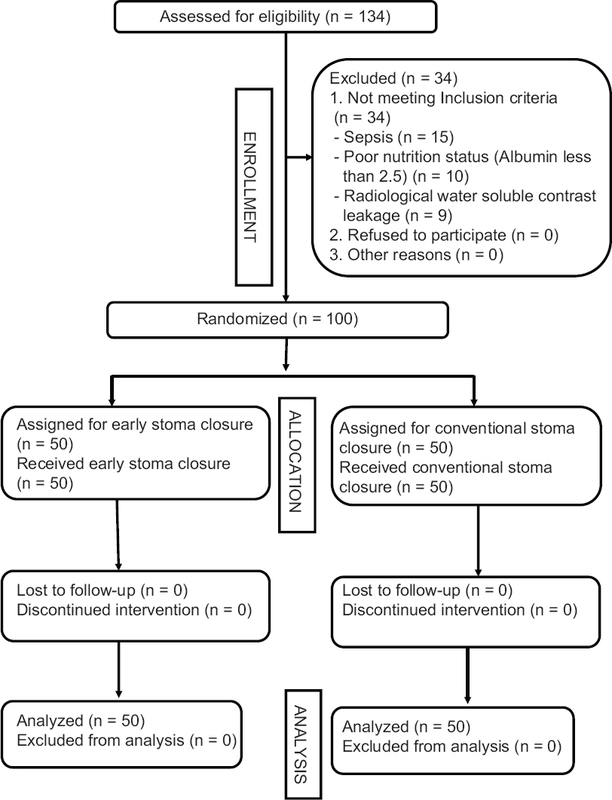 Patients in the early stoma closure group also had a significantly better QoL. Conclusion: Early stoma closure does not carry an increased risk of postoperative complications, reduces cost towards stoma care, and leads to better a QoL. Background/Aims: Probiotics play a role in relieving irritable bowel syndrome (IBS); however, the underlying mechanism is yet unclear. The aim of the study was to investigate the effects of the supernatants of Lactobacillus acidophilus and Bifidobacterium longum on the expression of serotonin transporter (SERT) messenger ribonucleic acid (mRNA) and protein. Materials and Methods: HT-29 and Caco-2 cells were treated with different concentrations of L. acidophilus and B. longum supernatants for 12 h and 24 h, respectively. SERT mRNA and proteins levels were detected by real-time polymerase chain reaction (real-time PCR) and Western-blotting. 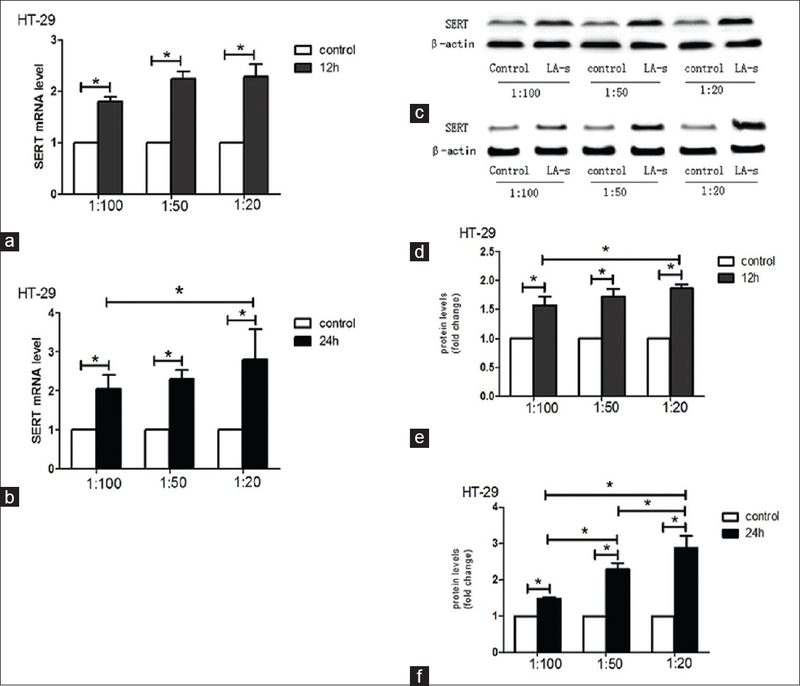 Results: The mRNA levels of SERT in HT-29 and Caco-2 cells treated with different concentrations of L. acidophilus or B. longum supernatants for 12 h and 24 h, each, were higher than that in the control groups. In addition, the expression of the protein in both cells was also upregulated, which was approximately similar to that of the corresponding mRNA. Conclusions: L. acidophilus and B. longum supernatants can upregulate SERT mRNA and protein levels in intestinal epithelial cells.